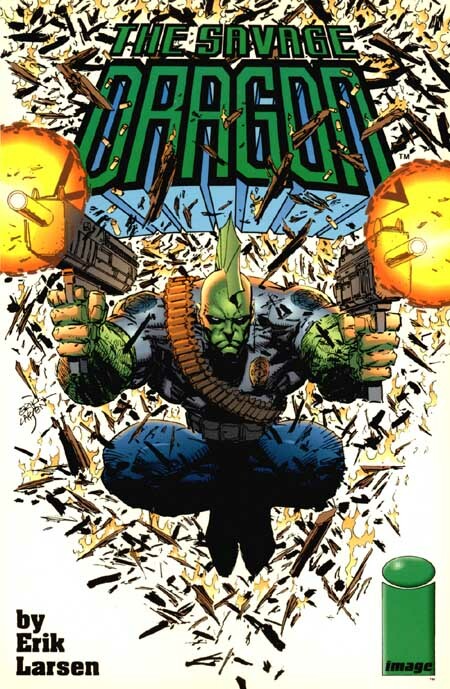 A green-skinned, fin-headed, fire-resistant man awakens in a hospital bed where he is informed by a police officer named Frank Darling that he had been found naked in a burning lot within the Chicago suburbs. The friendly man questions the patient and is shocked to discover that he has no memories of his personal life proceeding waking up and yet he still has memories of the world around him including the name of the President of the United States. Later on that night, Frank returns to his home where he explains to his loving wife Mildred of the strange case he has been charged with investigating and comments on his incredible strength and resistance to flames. The married couple finish their dinner while watching the news and are horrified to learn that the local superhero known as SuperPatriot has been discovered with his limbs badly injured as well as half of his face. The hero had been fighting crime since the 1940s and the possibility of him walking again is slim. Dragon is visited by his new policeman friend who requests that he join the police force so that he may aid them in their continuing battles against superpowered criminals. He refuses the offer as it has only been just over a month since his awakening and he is still trying to figure out his life. Frank returns home to his wife and starts to worry about the city without aid of new superhumans. Two supervillains named Skullface and Hardware target the shipyard warehouse where the Dragon is both living and working so that they may extort money from the owner of the business, a hardworking man called Fred Darling. The amnesiac superhuman decides to act and uses his tremendous power to defeat the criminals with relative ease, allowing the local law enforcement officers to take them away. A previously planted explosive device activates and decimates the building, killing Fred and leaving his new employee without a home or job. A young nurse named Ann Stevens checks up on the superpowered patient that had been brought in a few days ago and comes up with a name for him that she thinks goes with his body, Dragon. The newly named superhuman is then fixed up with a job by Frank Darling. A month later, Frank grows increasingly worried about his city as he goes to bed following the news of his cousin’s death and that the Dragon will now enter the police academy where he spends the usual eighteen months training to become a fully-fledged officer of the law, meeting a number of fellow officers. 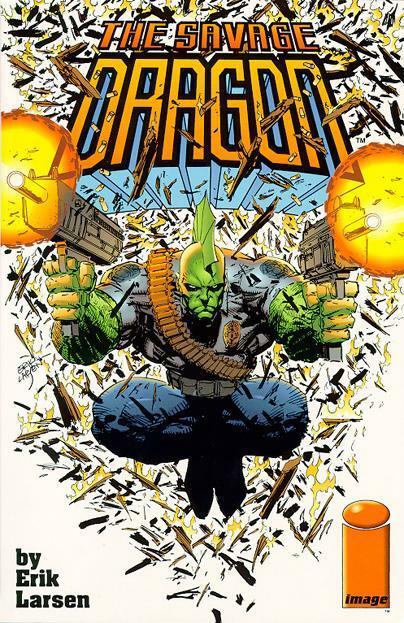 The superhuman police officer known only as the Dragon jumps into battle against a supervillain couple called Cutthroat and GlowBug, who are in the middle of robbing a bank and are responsible for the deaths of dozens of innocent bystanders. The hero knocks out the female criminal with a single punch and tears her male partner apart. Eventually Cutthroat is convinced to give up once he realizes that he cannot harm his foe. After carting his latest prisoners away to the cheer of a fearful crowd, he reflects upon his known past. Young female police officer Alex Wilde calls in for back-up when twenty-three men hold a number of hostages and begin to gun down several of them. Dragon answers the call and uses great agility to leap up above the barricaded house and crash straight through the roof where he shoots down all but one of the men without killing a single man. The only surviving hostage, a young woman named Amanda Mills is held with a gun to her head and the man holding her appears to have the advantage when a costumed vigilante calling himself Star bursts onto the scene and unleashes several shuriken blades into the criminal, leaving him bleeding on the floor and posing no threat to anyone. The wise-cracking young hero then leaves the scene to avoid being arrested himself. The Dragon makes his way through the sewers of Chicago where he battles an overweight superpowered creature who calls himself Arachnid. The evil man reveals that he has been feeding upon the citizens of the city for years, especially enjoying the taste of children. Due to his lack of fitness the fight lasts only moments and the policeman claims another prisoner. A cybernetically-enhanced SuperPatriot awakens after his lengthy restoration by CyberData, the infamous company that specializes in the production of cyborgs. He ponders the sanity behind his decision to make a deal with the group, simply so he can go back to fighting crime. Dragon moves into a new apartment building where he meets an eighteen year called Debbie Harris who is fascinated by his strange appearance but also finds herself attracted to him. Dragon awakens from a nine day coma in time to knock out the superpowered criminal Inferno who had been sent to kill him while he was immobile. He learns that his body had shut down following the massive injuries he had suffered and amazingly an advanced healing factor took care of his cuts in minimum time. His fellow police officers then state that Skullface had recently been released from custody as there was no evidence to connect him to the explosion that had killed Fred Darling but his partner Hardware had been kept a hold of as he had actually threatened the superhuman policeman. And the two surviving villains gunned down by SuperPatriot were currently in critical condition in custody. The armored OverLord is furious that his plans to eliminate all three of his eager followers, as well as Dragon, by striking a business partnership with the organization CyberData and having their latest weapon sent out to destroy all four of them. With the failure of this scheme, he severs his partnership in a phone conversation with Kimata. As he prepares to leave the hospital, Dragon is approached by the woman he had rescued from armed men, Amanda Mills, who tries to seduce him in order to ’properly thank him’ for saving her life. He rejects the offer before talking with the nurse Ann Stevens, who had previously named him and recently helped save his life. She declares that she had been incredibly worried about him when he was rushed into hospital just over a week ago and reveals that she had been with Mighty Man when he died there and had feared history repeating itself, but this time the new policeman being the victim. After leaving to return to duty, Badrock bursts onto the scene and sparks a violent confrontation between Dragon and himself that causes hundreds of thousands worth of property damage. The two powerhouses’ battle makes the news as he is watched by an unimpressed Spawn, as well as an elderly woman who believes the policeman to be her long-missing son. Eventually the fight ends with the government agent stating that he had simply wished to test him in order to see if he was worthy of Youngblood membership. The young hero is arrested until his teammates bail him out. After a night of passion, Dragon relaxes in his apartment and gets ready for work. Debbie Harris responds when she hears a knock at the door. As she opens up the apartment door, her former boyfriend, Arnold Dimple, shoots her dead before taking his own life. He had been aiming to murder the freak who he believed had stolen his girlfriend. At the funeral of her daughter, Bonnie Harris blames the murder on the hero and her hatred for him is so intense that it disturbs the object of emotions, Dragon. He enters a depressive state that not even Frank Darling can bring him out of.